Get full scans of ALL articles when you support the website by becoming a VIP-member for only $10. Joe Biroc, ASC, wondered whether anyone would be interested in reading about his role in heading the unique Action Unit during the filming of THE TOWERING INFERNO. He wasn't being coy. Biroc just didn't think that he had done anything that spectacular while filming the main action for the 20th Century-Fox-Warner Bros. blockbuster. "I had never worked for Allen before, and I didn't even know they were thinking about me," he recalls, "I just got this call inviting me to visit the studio. I walked through those fantastic sets - most of which were already constructed - and scanned art director Bill Creber's sketch books. These detailed exactly how each action scene was going to be filmed. We (Creber and Biroc) chatted some, and then Allen came out and asked me into his office." Allen asked Biroc if he liked the concept. Receiving the answer he was seeking, the producer then said, Then it's yours." It was that simple. 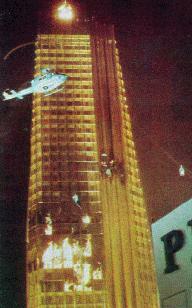 THE TOWERING INFERNO, which cost the two studios an estimated $ 15 million to produce, is in a large sense a throwback. During recent years most of the big money-making pictures have strived for the economies and reality of location filming. However, the only way you could film something like THE TOWERING INFERNO short of large scale arson would be to conjure up ample potions of the Hollywood magic of old and shoot on a sound stage where absolute control can be exercised. It was a three man cinemagraphic show. Fred Koenekamp, ASC, was Director of Photography for the first unit, which was responsible for all of the dramatic and background filming. Bill Abbott, ASC, came out of retirement to supervise the special photographic effects, which included the use of miniatures, matte paintings, and blue screen photography. Biroc's task: Work with producer Allen, special effects man A.D. Flowers and Abbott to capture the drama and excitement in a way that will make it all seem true to audiences which have been fed a steady diet of realism during recent years and know how to recognize fakery. Special considerations: As anxious as he was to make it seem real, Allen was aware of the need for safety. No fewer than 30 people from the San Francisco, Los Angeles and studio fire departments were on the stage during the biggest action scenes. The San Francisco Fire Department assigned Battalion Chief Jack Cavello to be there as technical adviser. The Los Angeles Fire Department had Battalion Chief Pete Lucarelli oversee the safety of the cast and crew. During the fire scenes, Biroc says, there was one Los Angeles fireman detailed to each person in the cast. Their assignment was to assure the safety of that individual. Meanwhile, the studio fire department protected the premises. 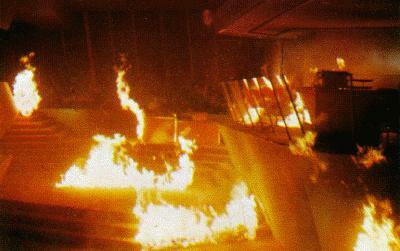 To prevent the spread of the many fires set for filming purposes, all of the sets had to be enclosed. Generally there was a fireproofed ceiling and at least three walls. Another restriction was the time that a fire would be allowed to burn at full force. The fires, Biroc explains, were all fed-propane from one-inch valve-controlled hoses. While the gas was running full force through the hoses, the flames and the build-up of heat was enormous. Generally the Los Angeles fire department limited these sequences to 20 to 30 seconds. All of this added up to some substantial challenges for Biroc. His camera and lighting positions were limited by the construction of the sets, and he had only short periods of time to film the most dramatic sequences. During most of the action scenes, many of the principals in the cast were all on the set, so there was a lot to cover. Continuity and planning were essential ingredients for success. Biroc's Action Unit never followed Koenekamp onto a set until the first unit was done with it. "After all, either we were going to burn it, saturate it in water or blow holes in the walls and ceiling," Biroc explains. "It wouldn't have been practical for then to be waiting while the sets were patched up after we shot. As it is, we usually went three, four or five takes ourselves and sometimes more." As a result, the Action Unit frequently followed Koenekamp's crew onto a set after intervals of many weeks. This required real communications between them. "It wasn't only a question of everyone and everything having to be in the right place after that long an interval of time," Biroc recalls, "it was also a matter of our being able to pick up on the look and mood created by Fred's unit." However, the lab which processed the film for the picture wasn't ready to handle that much - some two million feet over a four-month period - of the new negative. Therefore THE TOWERING INFERNO was shot almost entirely with Eastman color negative film 5254. The exception was the miniature work done by Abbott. He used the new negative because the finer grain pattern contributed substantially to the overall believability of the film. The tests filmed jointly by Koenekamp and Biroc set the pattern for future cooperation. Even though he didn't start filming for several months afterward, Biroc was on the set the first day that Koenekamp began production. "We talked everything over," Biroc relates, "and as a result, I had the feel of what he was doing. I could pick up a scene wherever he left off and never lose a beat." That, of course, is just the tip of the iceberg as far as preparation was concerned. Allen worked on a day-to-day basis with the Action Unit. Before each day's shooting, he walked the entire production crew - maybe 30 to 40 people - through every sequence, asking questions and probing for better ideas. "Everyone had one of Allen's sketchbooks in his or her hands," Biroc comments, "so, we knew exactly what we were talking about. It paid off in several ways. The original plan was altered several times, both for safety reasons and, also, whenever someone had an idea which worked better. Our shooting went very smoothly because of all the preparation." The greatest number of cameras were used on the giant Promenade set, which covered an entire sound stage. These cameras had to be strategically positioned not only to cover the characters and action, but also to stay clear of each other. The basic idea, Biroc explains, was to isolate at least one camera on each of the main characters and one or two others on the elements that they would have to contend with during that sequence - fire, water and explosions, sometimes all three. Three weeks were spent shooting on the Promenade set alone. Eight cameras were employed during the water scenes, and between five and seven most of the rest of the time. Generally the cameras were positioned in an oval surrounding the set. Biroc had to take advantage of every break in the set for the cameras, and when that option wasn't available he created his own positions by overturning a table or creating other obstructions which were acceptable for the scene. Lighting for the scenes was another considerable challenge, and Biroc gives a lot of credit to his gaffer, Bill Hannah, for his ingenuity in doing this. "Unlike Koenekamp, we couldn't remove sections of the ceiling to light overhead during the big fire scenes," he explains. "That would have raised a number of problems. First of all, it would have increased the danger of the fire spreading, and that risk obviously wasn't acceptable.  Furthermore, the set ceilings contained the heat as well as the flame. And that's all that kept the overhead sprinklers on the sound stage from going off." This left Biroc with the remaining option of using mainly fresnel-type quartz lights. It took him just a few days of working on the big fire scenes for Biroc to realize, however, that in many cases, he didn't need any artificial illumination. In the story, most of the fire scenes occurred at night or after the power was out in the building, so the flame itself was enough to provide realistic illumination. "The first time we tried this, Allen asked me when we were going to be ready," Biroc recalls. "We are, I told him. One of the nice things about working with Irwin Allen is that he doesn't care how you solve your problems. All he cares about is how it will look in the theater. As a result, he was usually willing to let us try things our way as long as they worked." The multi-camera setups provided for a great deal of flexibility. A lot of film was exposed from different angles and positions. While these setups limited the mobility of the cameras, the zoom lenses were used very effectively to create a feeling of movement, he explains. To further compensate for the short takes, Biroc often exposed film at two, three and even four times the normal 24-frames-per-second rate. "By shooting at 48, 72 and even 96 frames-per-second," he comments, "we were able to stretch out the most intense action two to four times longer. The limitation that this caused, of course, was a need to either open up (....) or bring in more light. Fortunately, we took full advantage of the Eastman Kodak color-film latitude to compensate and because of the brightness of the fire and the fact that we were working with a comparatively small stop to begin with." One of the major problems was lighting for all of the cameras, when they were, in effect, working in opposition to one another. "What was good key light for one camera, was poor backlighting for another," he explains. "In the end, we just had to make some small compromises, which didn't prove to be a problem because we were shooting so much good footage." Smoke was another problem. It was carried up by the heat of the fire - which was hot enough to melt three matte boxes. Sometimes the smoke build-up occurred so fast that it altered exposure readings and affected visibility. Biroc located the cause of the rapid smoke build-up. It turned out that plastic curtains used on the sets and rubber cement that was used liberally on the clothing of some of the characters (to create smoke) were the main sources of the problem. They created too much smoke, too fast. The solution was simply to utilize a different type of curtain material and to use less rubber cement. Another critical action sequence involved shooting the Promenade set when the water tanks were blown. The entire area was on fire, and the characters had lashed themselves to columns and railings to keep from being washed away. The water actually used during the sequence was kept overhead in 12,000-gallon-capacity tanks. The flow was directed along chutes, which guided it to the entry points in the ceiling. Flowers was able to pinpoint exactly where the main force would hit - which helped immensely in positioning cameras - but not where it would splash or flow. Shooting this sequence with that many cameras also created some unique challenges. If anything, it required even more critical lighting, since, unlike the fire, water didn't provide its own illumination. Here, too, the problem was that good key lighting for one camera didn't do the job for another. The only real solution to this quandary, Biroc says, was to plan carefully and shoot a lot of film. Gaffer Hannah also had to step lively during this sequence, since there were four lighting control boards, each having four to five switch boxes on the floor. With all of that water flowing unrestrained, he had to maximize precautions for keeping the electrical equipment dry. Furthermore, even though he covered the more exposed lighting fixtures with aluminum foil or asbestos all it took was one drop of water on a hot lens to smash the glass. There were several such occurrences. This was the scene where the Panavision underwater camera was utilized. Biroc positioned the camera exactly where Flowers told him it would receive the main impact of the water. The operator worked in a bathing suit and rain gear. In fact, during the water sequences, all of the crew wore boots and rain coats. There were, of course, some inevitable miscalculations. Once, just before Allen was ready to roll, Biroc noted that a chair was out of position near the edge of the scene. When he went to remove it, its weight caught him by surprise. "I started to lift the chair and nothing happened. It was made of rawhide, and must have weighed a ton," he recalls. Allen didn't notice and called, "Roll 'em." Biroc scrambled to get off camera, but even so, he took a pretty good soaking. However, the precautions taken by Allen and the crew paid considerable dividends. Despite the great amount of action, with much of it involving million-dollar performers, there was only one minor injury, and that was suffered by the studio fire chief who cut himself on broken glass. While much of the action footage was focused around the Promenade floor, it was only one of seven enclosed sets that were used for more than 40 scenes. There was one startling sequence, for example, when one of the building's tenants (played by Robert Wagner) found himself trapped, and decided to rush through a burning doorway. Three cameras documented the scene as a stuntman wearing a fireretardant outfit and breathing from a self-contained oxygen supply under his coat made the dash and got caught in the fire. That scene was mainly a question of precise timing. Biroc recalls. The stuntman only had a limited supply of oxygen, and the fire department didn't want him burning for longer than 30 seconds, so the camera operator's timing had to be right on. Another exciting scene involved an elevator carrying a dozen passengers through the holocaust. The buttons on the elevator control panel are activated by heat. This causes the door to open on a floor where firemen have been fighting a spreading blaze. As the door opens, a propane jet is turned on, and the effect is that of a ball of fire swooping into the elevator. This was documented by two cameras located behind the crowd in the elevator. The fire was actually stopped by a thick sheet of clear plastic. However, on film, the illusion of the ball of fire sweeping into the elevator is almost too real. Biroc also documented the same scene from the opposite perspective. He had five cameras on the hallway set. Several of these were isolated on Steve McQueen to capture his expression and actions as the tragedy occurs. Another camera stayed on the fire and two more looking in on the people in the elevator as the door opened and the flames appeared to engulf them. In some ways that was the most unique set of all, since it also contained the stairwell and three elevator-shafts. The last two were like a four-story tunnel, Biroc relates, which required digging a deep hole two floors beneath the sound stage. Blue screen process photography was utilized most effectively here in a sequence shot down the stairwell, creating the illusion of a deep well. There's one scene that particularly stands out. Newman is leading a small group to safety when an explosion rips the stairway out from under him. He falls headlong until he is able to grasp what's left of the hand-rail and swing to safety. Then, he encourages those with him to follow him past the yawning gap. In this scene, a matte painting was used to complete the process shot, Biroc explains. Not all of the Action Unit's work was done at the lot, Biroc points out. The crew spent a day in San Francisco shooting fire engines on location documentary style and another in downtown Los Angeles, where a parking lot was utilized to shoot some helicopter landing scenes. However, the bulk of action exteriors were shot at the Fox Ranch in Los Angeles. Perhaps the most complicated scene was the night landing of a rescue helicopter on a fiery pad. The studio actually built a 20-foot-high concrete pad where the helicopter was able to land. Lights were set up on seven forklift trucks surrounding and level with the set. Each forklift held up to three brute arcs and Biroc had four cameras operating all the time. "It was the kind of movie," Biroc sums up, "where you can't wait to get on the set as soon as your eyes open in the morning because something interesting is happening every day. Then, you end up going home dead tired each evening." It was a physically-demanding production partially because of the multi-camera setups. "Fortunately, I had some excellent operators," he says. "What I did was circle the stage talking to one operator at a time. We always had a chance to rehearse each scene. I told them that if they saw something that we should or shouldn't be doing to let me know when I circled back." It also took excellent team-work from the entire production crew. As many as six people were controling the fire, Biroc points out, and their timing was critical. And there were as many as 40 other people behind the scenes, keeping the water tanks filled, and another 30 getting fires ready, and the sets dressed. "You wouldn't believe the damage that we could do to a set during a 30-second take," he comments. "Then, those crews would get out there and replaster and repaint, bring in new carpeting and drapes, and clean up. In 10 to 20 minutes, we would be ready to shoot again." If there was one point that Biroc appeared especially anxious to get across it was that he didn't do anything that hadn't been tried before. He thinks that Allen deserves special kudos for the energy and imagination with which he pulled together some of Hollywood's best talent both in front of and behind the camera for the making of an epic which could well become a milestone in film history.